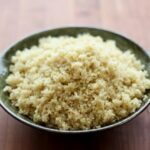 Quinoa (pronounced KEEN-wah) has been given a lot of attention over the past few years for its high nutrient content, versatility and unique flavor. Have you tried it yet? 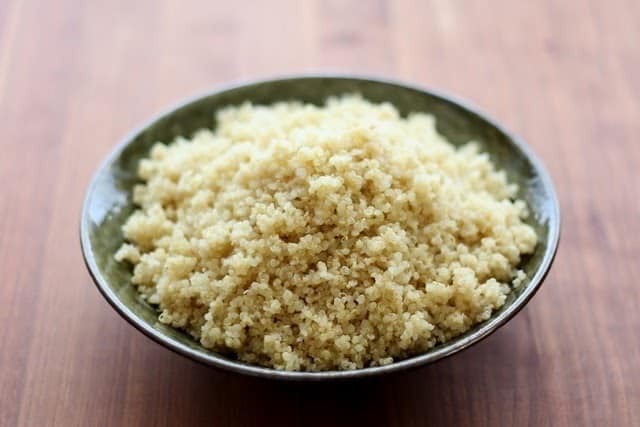 Quinoa can be prepared and eaten similarly to grains like rice and couscous as both a side dish and a main dish. It goes well with so many different types of vegetables, meats, sauces, and dressings–and you can even use it in desserts! 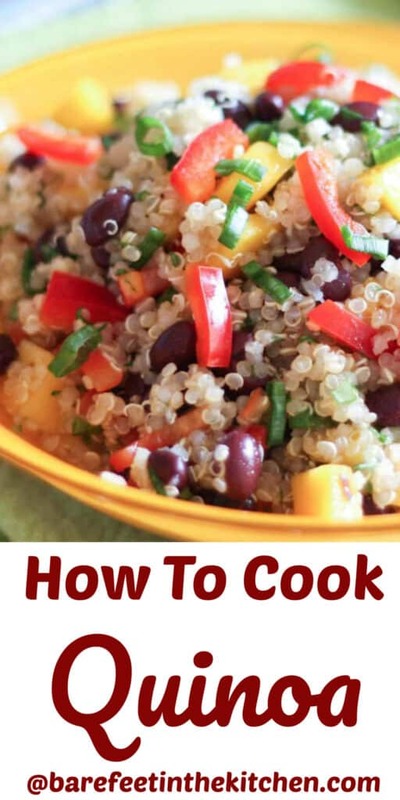 If you’re new to quinoa or just need some tips, I’m going to break down exactly how to cook quinoa for you in this post. Quinoa cooks like a grain but, technically, is a seed! Cultivated for hundreds of thousands of years, quinoa was a staple of Incan and other central American native diets for centuries. There are a few different varieties of quinoa on supermarket shelves these days. White quinoa is the most common type (and the kind I use in most recipes) and has a mild flavor and light texture. Red and black quinoa is also common. Both these varieties tend to taste a little nuttier and have a firmer bite. 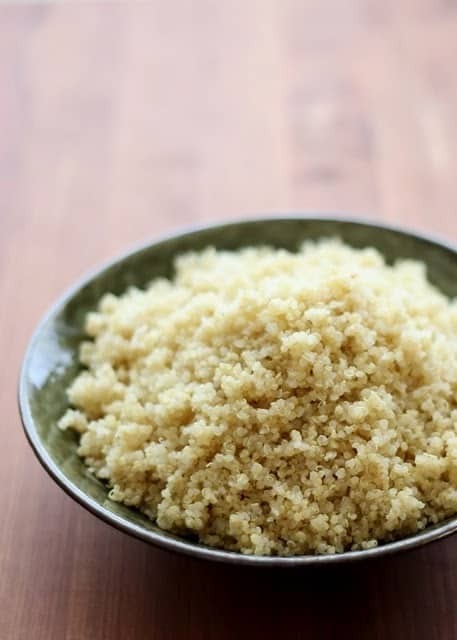 Did you know there are 8 grams of protein in a cup of cooked quinoa?! That same cup also contains 5 grams of fiber and a ton of magnesium, phosphate, and antioxidants. It is a nutritional powerhouse and good higher protein substitute for the starchier rices and pastas. Of course, I cook with quinoa just because I find it delicious! I have some new quinoa recipes coming up on the blog in the near future and I decided that a quick how-to for basic quinoa would be a simple way to start. Are you a fan of this nutty grain? At its most basic, quinoa cooks just like rice. The dried grain is mixed with water and then simmered on the stove until tender and fluffy. From there you can season and eat it as is or add it to your favorite recipe. Depending on how I plan to serve the quinoa, it can also be sauteed for a few minutes in a hot skillet with a dab of butter, olive oil or coconut oil before adding the water and salt. This will result in a toasted and slightly more nutty taste. Feel free to substitute chicken or vegetable broth for the water, if you’ll be using the quinoa in a savory dish. The broth adds saltiness and a nice savory flavor to the finished quinoa that works beautifully in many dishes. If your quinoa tastes bitter, rinse it well in a mesh strainer prior to cooking. The organic quinoa that I’ve been buying for the past few years has never tasted bitter, so I rarely rinse mine anymore. There are so many uses for quinoa that it’s worth making a big pot of it at once and using quinoa in several recipes throughout the week. It’s easy to learn how to cook quinoa and, in no time at all, you might find it’s become a staple of your home cooking repertoire! Already familiar with quinoa? Check out these great recipes for more ideas: Lemon Herb Quinoa, Mango Quinoa Salad and Greek Quinoa Salad are excellent side dishes to make and enjoy all year long. 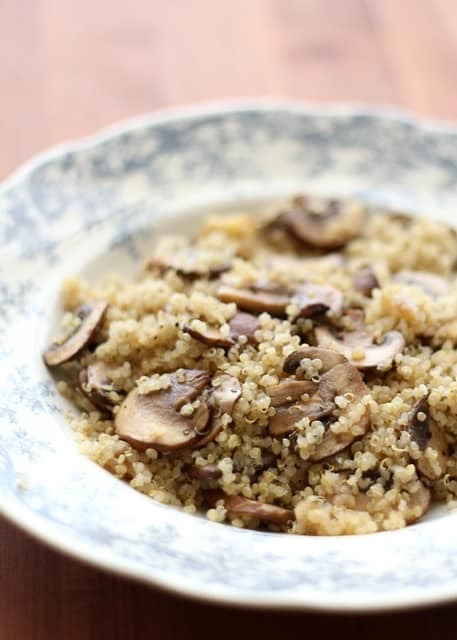 Roasted Garlic Quinoa with Mushrooms is a recipe that can be served as a side dish or heaped in a big bowl to act as a main dish all on its own. It’s an excellent way to experience quinoa for the first time and perfect canvas for adding meat or other vegetables. Beyond side dishes and salads, quinoa can also be served in crispy Quinoa Cakes as an appetizer or used as a vegetarian ground beef substitute like in these Beef Taco Quinoa Salad Bowls. 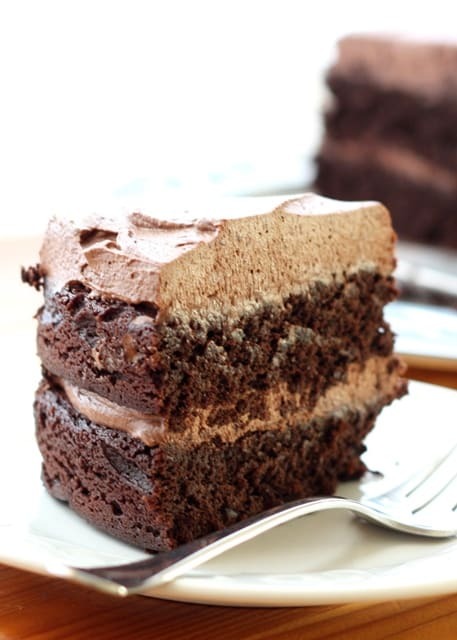 And you definitely shouldn’t miss the Unforgettable Chocolate Quinoa Cake. (Don’t be a doubter, that cake is truly fantastic and all of the readers that have tried it have been just as impressed! Cold leftover quinoa makes a great protein-rich filling for veggie burgers, too! You could also put it in your favorite fried rice or stir fry recipe as a way of mixing things up and adding more protein and fiber to your meal. Quinoa is a delicious, fun, interesting and tasty addition to your dinner table. 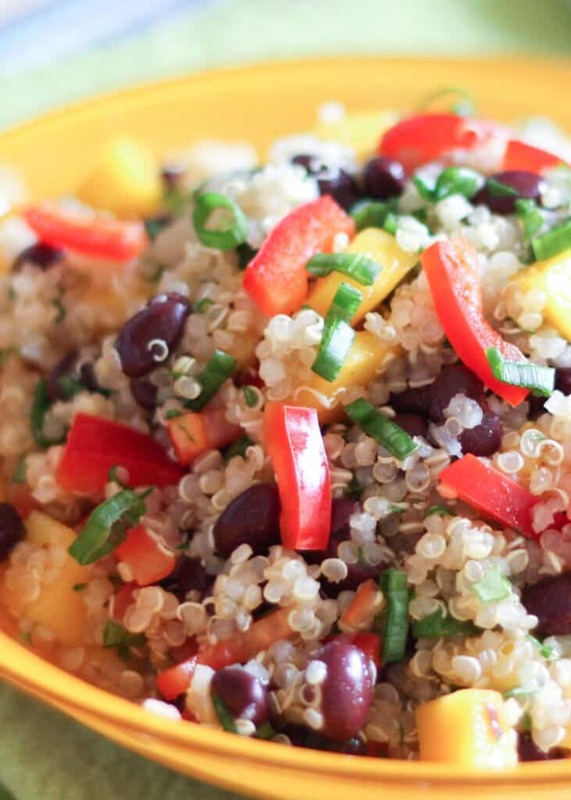 Shake things up and add quinoa to your meal plan this week! Combine quinoa, salt and water in a large saucepan. Cover with lid and bring to a boil. Remove from the heat and leave covered for at least 5 minutes. While technically not a grain, quinoa can be prepared as both a side dish and a main dish. Combine quinoa, salt and water in a large saucepan. Cover with lid and bring to a boil. Reduce the heat and simmer for 15 minutes Remove from the heat and leave covered for at least 5 minutes. (I often leave mine covered for up to half an hour and it will stay warm until I'm ready to serve it.) Fluff with a fork and serve. Enjoy! Mary - Please check my blog if you get a chance. Thank you so much for this post! I have wanting to learn how to cook this correctly. I'm starting to warm to quinoa---I made a few salads last year and I was impressed with how it held up and didn't get soggy, even after a day or two in the fridge. Just wondering if it would cook well in a rice maker? Great thanks Mary, will give it a go - saw black quinoa in the supermarket the other day that looked very appealing.